U.S. Secretary of State John Kerry speaks about Pacific trade policy during a speech before the Pacific Council on International Policy at the Omni Hotel in Los Angeles, Calif., April 12, 2016. Secretary of State John Kerry on Tuesday touted the benefits of two major U.S. trade pacts that have faced skepticism from some members of Congress, trade groups and presidential candidates. In a speech to a Los Angeles international policy group, Kerry said the trade agreements have broad benefits that include defending U.S. strategic interests and strengthening national security. In February, foreign officials signed the Trans-Pacific Partnership (TPP), a massive trade deal involving the U.S. and 11 other Pacific Rim countries — a group whose total gross domestic product constitutes about 40 percent of global GDP. The deal, which includes rules for the international trade of drugs, cars and dairy products, still needs U.S. congressional approval. The pact has an uncertain future in the U.S., partly because of U.S. lawmakers' concerns that the deal would hurt trade and investment. 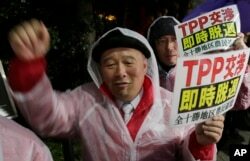 FILE - A protester shouts slogans during a rally against the Trans-Pacific Partnership (TPP) in Tokyo, April 22, 2014. In a March letter to President Barack Obama, a bipartisan group of New York lawmakers said they were “skeptical” that the TPP would “fare better than previous trade agreements.” They cited provisions of the North American Free Trade Agreement (NAFTA) and said those had resulted in the loss of thousands of jobs in their state. He cited critics who have said the plan would cost U.S. jobs. “The primary reason old jobs disappear is not trade but technology, and certainly not trade agreements,” he said. 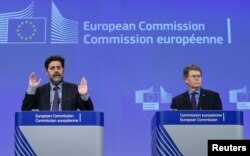 European Union chief negotiator Ignacio Garcia Bercero, left, and U.S. chief negotiator Dan Mullaney speak to reporters after the 12th round of E.U.-U.S. trade negotiations for the Transatlantic Trade and Investment Partnership (TTIP) in Brussels, Belgium, Feb. 26, 2016. Kerry’s California appearance wraps up a weeklong tour that included stops in Bahrain, Iraq and Afghanistan. He traveled to California from Japan, where he took part in a meeting of the Group of Seven industrialized nations and visited a World War II memorial site in Hiroshima.